Brooke Chornyak is an experienced designer, educator, and collaborator who has presented papers both nationally and internationally in a wide variety of settings. In 2004 she earned her BFA from Rochester Institute of Technology and went to work as a designer for CBT Architects in Boston where she was part of a five-person design team working collaboratively with architects and urban and interior designers to craft programs focused on reinforcing design integrity to give additional form to clients’ intentions. In 2010 she earned her Masters in Graphic Design from North Carolina Sate University and began working as an Assistant Professor of Graphic Design at Virginia Commonwealth University in Richmond, Virginia. There she conducted research on food systems, tool makin,g and collaborative methods for interdisciplinary work. 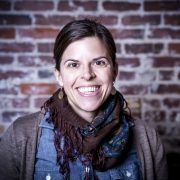 Brooke is the co-founder of Collective IQ, a human-centered design research lab located in Portland, Maine.